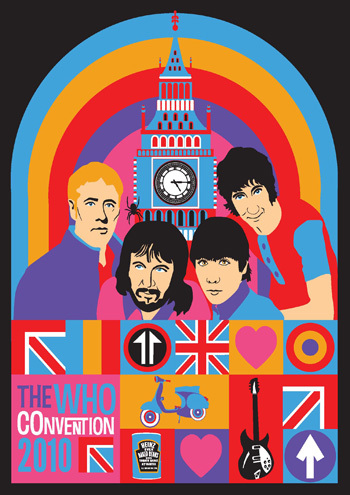 For over 30 years, fans of The Who have been gathering at conventions to celebrate the work of Messrs Townshend, Daltrey, Entwistle and Moon, and to raise money for some great causes. The 2010 convention is specially medicated to do just that; make your pits flit and turn you into a beast of a man! This year we are offering a two day event, starting with warm up events in Kilburn on Saturday October 2nd, followed by the main event at Dingwalls in Camden Market on Sunday October 3rd. Expect rock operas, films, memorabilia, auctions and some very special guests as part of this convention. The proceeds will be split between the Teenage Cancer Trust and the Meg Fox Educational Trust Fund set up to benefit our dear late friend's children. Our brief for this convention is simple. We want you to have a great time by celebrating as much of the Who's vast body of work as we can possibly fit in, and to make whatever difference we can to these worthwhile causes! We hope to see you in London over October 2nd and 3rd. Until then, Long Live Rock!